Eddie Mark takes Buffalo City title! 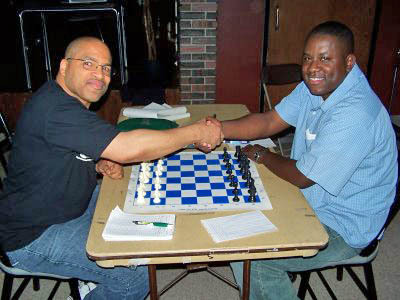 Eddie Mark III (right) shake hands with Douglas DuBose prior to the final round of the Buffalo City Championship. The game was quickly drawn giving Mark the title. Photo from buffalochess.blogspot.com. Eddie Mark III has won the Buffalo City Championship on June 10th beating out top local players Lionel Davis and Barry Davis. In head-to-head battles against the Davis duo (no relation), Mark scored a win against Barry and drew with Lionel and ended up with an undefeated 4-1 score. With his win he received a handsome trophy and an invitation from Buffalo's mayor, Byron Brown to receive a citation. One interesting story was that of scholastic player Bob Shao, a 7th grader who held both Lionel and Barry Davis to draws and beat Mark Clark. Clark came in joint second with Douglas DuBose and handed Lionel Davis his only loss in the final round. Davis, know as "laser" or "ultramodernist," came in 4th-6th. Mark's son, Eddie IV, celebrated with his Dad. 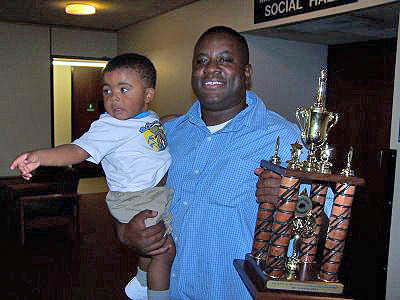 Eddie Mark III (right) celebrating with his son Eddie IV. Photo from buffalochess.blogspot.com.